When upgrading to an adjustable height desk, you have options. 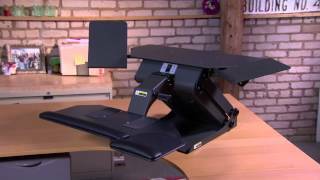 If you're in the group that wants the benefits of a sit-to-stand work style but you're not ready to commit just yet, the height adjustable Health Postures Computer TaskMate Journey 6200 can transform your workspace with one simple tool. Attached mouse and keyboard trays ensure you're saving space on your desktop while giving you the ergonomic benefits of a workstation that sits on your level. HealthPostures products are made in the U.S.A and are TAA compliant for Government orders. HealthPostures is proud to be among the few suppliers of ergonomic office products to manufacture and assemble their products in the United States. The Health Postures Computer TaskMate Journey 6200 is available with an 8" x 10.5" copy or telephone holder. This holder attaches to the TaskMate Journey 6200 so that your documents or telephone move with you as you go from sitting to standing. The TaskMate 6200 is available with a dual flat screen monitor mount with articulating arm or a laptop holder/flat screen monitor arm combo. Each option features a pole height of 17.6". Height of monitors of laptop can be adjusted on the pole. The Dual Monitor Arm supports two monitors that weigh up to 17.5 pounds each. Each arm features height adjustment, tilt, pan, portrait-to-landscape rotation and cable management system. The Dual Articulating Arm ships with clamp mount and bolt-through mounting options as well as mounting hardware. The Laptop and Monitor Arm Combo supports one monitor that weighs up to 17.5 pounds and one laptop that weighs up to 17.5 pounds. Each arm is height- and tilt-adjustable. The monitor arm features portrait-to-landscape rotation and a cable management system. This combination ships with clamp mount and bolt-through mounting options as well as mounting hardware. $860.00 List Price: $999.00* The list price is the same as the MSRP (Manufacturer's Suggested Retail Price). It may not necessarily be the price at which the product is sold.